Just half an hour from the city, the Perth Hills are home to some amazing cafes, restaurants, wineries and shops that are well worth the drive. The hills are also the starting point of the Bibbulman Track and home to some pretty impressive scenery so you'll never be stuck for things to do! Not only is the vibe relaxed and casual, the Perth Hills offer up stunning views of the city and plenty of opportunities to get out and about in nature. Here’s everything worth eating, drinking, seeing and doing in the Perth Hills. Jack and Jill went up to the Hills and opened a freakin’ awesome cafe with loads of incred eats on offer. One order of the brioche french toast with hibiscus curd, cumquat jam, vanilla cream and fresh berries and you'll be hooked. If you're more of a savoury kind of person, you'll want to try the buttermilk fried chicken burger. The guys at Jack & Jill are so amazing and friendly, you'll feel like you're right at home in their humble little abode. With Print Hall’s former head chef, Brad Johnston, his partner Jacklyn Noel and the ex-venue and bar manager of Rockpool, Matt Nguyen at the helm, Mason & Bird was always going to be a rip-roaring success. Situated next to the old Kalamunda History Museum, these guys serve delish dishes in a casual environment. Think avo with charred corn salsa, savoury waffles, homemade cocoa pops, burgers, lamb pappardelle and pan fried gnocchi. Yum! 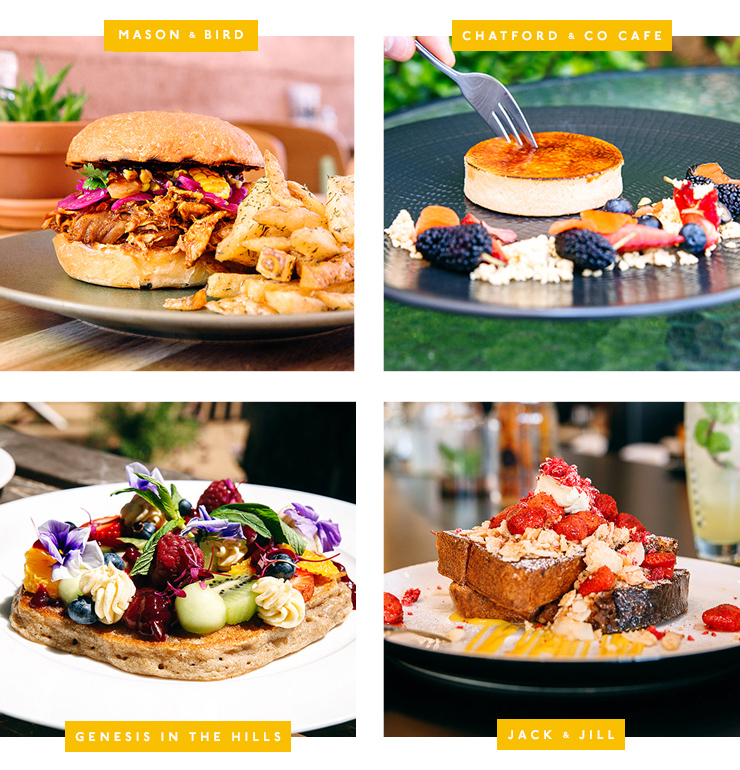 Tucked away among the trees in Roleystone, Genesis in the Hills dishes out some of Perth's best vegetarian and vegan eats. Everything on the menu is homemade with local and organic ingredients wherever possible—think vego lasagne, smoothie bowls, cold-pressed juices and raw desserts. Head in on the first Saturday of the month and you'll also get to hear from local jazz musicians while you munch on your goodies. Put it on your Hills hit-list, stat! World tapas is on the menu at The Cavern in Kalamunda we can't get enough. Choose from crunchy fried cheese stuffed jalapenos, double crumbed french brie, crispy prawn dumplings or any of the other scrumptious items on the menu. The Cavern also offers a banquet menu to make choosing a little easier (and life a little cheaper). Plus, they've got loads of gluten-free friendly items and a killer cocktails list. When that hot easterly breeze rolls in make way for Collodel Ice Cream & Sorbet right in the heart of Kalamunda! Known for their amazing homemade flavours the must try menu item has to be the Spaghetti Sundae—ice cream squeezed through holes (pasta), topped with raspberry and strawberry sauce (bolognaise) and sprinkled with sugar (parmesan). Funsies! After walking the zig zag head straight to Le Croissant Du Moilin for your post workout pastry fix. The French patisserie, boulangerie and cafe in Gooseberry Hill dishes up winning pastries, tarts, croissants and baguettes, as well as bowls of coffee. Yes, bowls! Vegetarian and vegan cafe and wellness centre, SoulJahs is a top notch spot to get your zen on in the Hills. Housed right next door to a yoga studio, the cafe serves coffee and healthy delights—think chia puddings, rice paper rolls, raw desserts and muffins. It’s also a hot spot for fun workshops like vegan cheese making and dream catcher workshops. For Sicilian food and plenty of Italian wine head to La Fattoria in Pickering Brook. This traditional trattoria is open Wednesday to Sunday for nonna-style lunches and wine tastings. Be sure to grab some fresh fruit and veggies from the orchard on your way out. Coffee, juices, kombucha and smoothies—Haynes Street Larder has got everything to keep you healthy, caffeinated and satiated. They’re also fully stocked in the brekkie and lunch department with salads, muffins, sweet treats and smoothie bowls. Grab a few take-away goodies, find a patch of grass in the nearby Stirk Park and enjoy a little slice of hills life! Where all the ‘Stoners go for their coffee fix, Orchard Espresso in Roleystone is a lovely little coffee shop and cafe serving awesome brews, breakfast and lunch, as well as take home dinners. There are loads of options for all the gluten free, vegans and vegetarians out there too. Stocking some of the best homewares, gifts and accessories in Perth, it's definitely worth the drive up the hill to visit First Avenue Kitchen & Home in Kalamunda. Think luxe cookware (hello Chasseur), a massive range of furniture, candles, soft furnishings and everything you need to make your home that little bit more special. Be warned, your time and money will disappear quickly when you visit First Avenue! Held on the first Saturday of every month, the Kalamunda Village Markets are some of the best markets in Perth. Organised by Rotary Kalamunda (so you’re supporting a good cause) you can expect loads of hand-made crafts and tasty local produce. Get down there early before all the good stuff sells out. Roleystone’s Meraki Collective stocks beautiful and ethically sourced gifts, homewares, books, toys and stuff for bubs. Think dreamy wall hangings, rustic ceramics, sweet-smelling candles, lovely skincare and delicate jewellery. Definitely a spot to check out if you’re passing by! 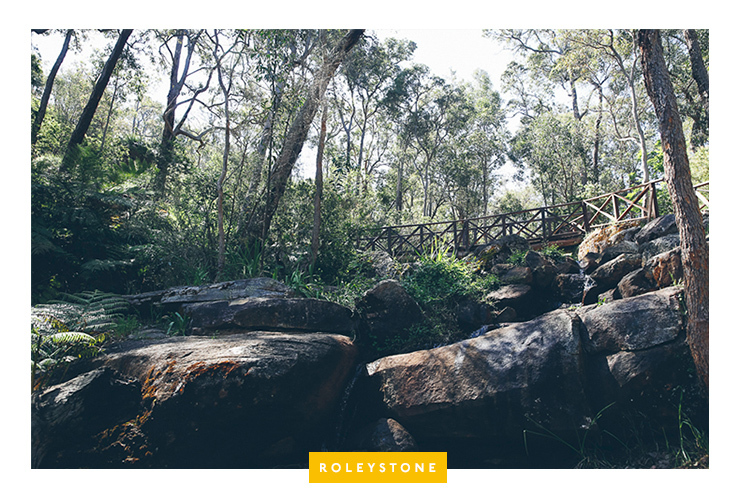 One of the best walks and hikes in Perth, the Bibbulmun Track kicks off in Kalamunda and if you’re game you can walk 900km to Albany. If not, just walk as far as you can manage from Kala before heading to Mason & Bird or Jack & Jill for some sustenance! Smack bang in the middle of a jarrah forest in Carmel, Masonmill Gardens is home to some of the most beautiful flowers you’ve ever seen. What was once a rose nursery, the gardens also encompass fish ponds filled with coi, lovely grassed areas to chill out on, a restaurant and craft shop. Aside from delicious wine and great food, the Bickley Valley and Carmel wine trail is also home to stunning wildflowers, beautiful forests, vines, cherry blossoms and wildlife. Nominate a designated driver and spend a day traversing this rolling region of the hills. Looking for more things to see and do out of the city? Check out 8 Of Our Favourite Swan Valley Wineries!